Unable to qualify for a bank loan? Need to borrow urgent cash to pay off sudden expenses? Take advantage of unsecured bad credit loans. These are unsecured loans that do not require any collateral to procure the cash. Besides, they have fixed term and fixed interest rates. If you do not have any personal assets to secure the loan or if you do not want to risk them even if you have, then unsecured loans are ideal. You must be aware of how a bad credit score impacts your chances of getting a loan. It is difficult to avail unsecured loans for bad credit. To qualify for a personal loan from traditional lenders, a perfect credit is mandatory. Banks do not accept poor credit. However, QuickFundUSA as a personal loans direct lender understands your constraints and hence offers unsecured bad credit loans. QuickFundUSA as an unsecured bad credit loans direct lender provides an easy alternative to secured personal loan bad credit that requires collateral. When dealing with financial crisis, hassle free and fast lending process is what you desire and we provide the same with dedication.Our guaranteed unsecured personal loans for bad credit features the following advantages for easy and timely borrowing in times of emergencies. Qualifying for Unsecured Personal Loans Online Made Simple. 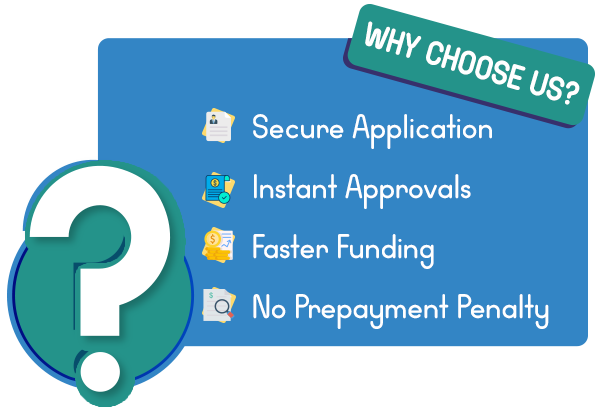 Applying, getting approved and receiving cash is this convenient and quick with unsecured loans for bad credit from direct lenders only such as QuickFundUSA. Do not wait. Apply now! Uncertain state of money landed me in despair. With so many lenders doing the rounds on internet, it was difficult to choose a reliable lender. I availed instant loan from QuickFundUSA and I am not disappointed. Require Larger Amount than Payday Loans? Get Online Installment Loans. Apply Now! We at QuickFundUSA do not extract loan applicants' credit related details from any of the 3 major credit bureaus- Experian, Equifax and TransUnion. If we feel the need to have any such information to take a decision on an application, we turn to an independent source. For your benefit, remember that your application is verified automatically by our system and therefore, the authenticity and verifiability of your submitted information decide how much time it takes for the decision. If any information appears to be missing, you would be asked to submit to validate your application. The rates and terms are not independent of the state laws and your income status. Note- Money requested after 6:00 PM EST will only be considered for verification on the next business day- usually, Monday if not a holiday. Call our customer service at - (800) 957-481 or email to support@quickfundusa.com for help.